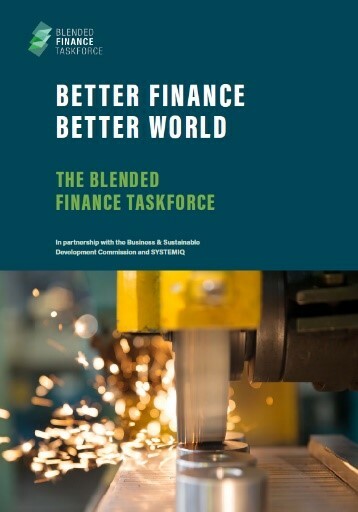 The Taskforce launched “Better Finance, Better World” to lay out the business case for blended finance as a driver of global growth. The consultation paper presents key areas where we can “shift the needle” to unlock largescale private capital for the SDGs. Momentum is building in the $50+ billion blended finance market. The market could double in the next few years as investors look to take advantage of risk mitigation tools and more development capital is made available for blending. To achieve this growth, we need to mainstream blended finance with more multi-billion dollar vehicles. Investors mostly want liquid, investment grade assets. They can look to use blended finance to improve the risk/return profile of infrastructure assets in emerging markets to “tip the scales” from below-investment-grade. Amending certain regulatory restrictions would make a huge difference. As would mainstreaming and scaling blended finance instruments, as has been done in the green bond market. Increasing the availability of infrastructure performance data in emerging markets is critical; globally, infrastructure equity has performed well relative to other asset classes and infrastructure debt has seen historically low default rates but information about unlisted infrastructure performance in developing regions is limited. Development banks play a central role in scaling up the blended finance market. MDBs currently mobilise overall less than $1 of private capital for every development dollar. This needs to increase significantly, along with their share of private sector activities. Setting ambitious targets will change the way development banks do business with the private sector. They should standardise products, reduce transaction times, pool assets and recycle them off their balance sheets, and driving reinforcing shifts in incentives and capabilities. Private investment will flow if there are bankable projects – a strong enabling environment is critical to build pipeline. Developing countries need to get policy and institutional mechanisms right and should develop blended finance institutions which can link policies to sectoral strategies, investment plans and sustainability standards. Development banks also play a critical role in policy reform and development of local capital markets, which are critical to building a stable investment environment. Scaling up the blended finance market can increase the global rate of growth, deliver the SDGs (including on climate) and strengthen long-term returns for savers. For this to happen, leaders across the whole investment system will need to take collective action. The Taskforce has been consulting on “Better Finance, Better World” with leaders from across the investment and development community. Together, we have developed an Action Programme for the next 12-18 months which will address systemic barriers to scaling private investment for the SDGs. See Bloomberg and The Guardian for press coverage of "Better Finance, Better World"